Dear Outer Space: Literary Quick List! Weave Issue 07 is here and available for reading. You should read one. I read my poem The Vicenarian or My Twenties So Far at the East Bay on the Brain reading in Oakland this past Saturday. Here is the poem that inspired mine, The Eighties by Brenda Hillman. Mary Stone Dockery has a lovely poem up at Everyday Other Things. Read it. Linebreak has featured two of my favorite poets these past two weeks. First up is Donna Vorreyer with Digging In. Also happy to see Molly Spencer's The Mail Order Bride Attempts a Letter Home. Audio for both is amazing! 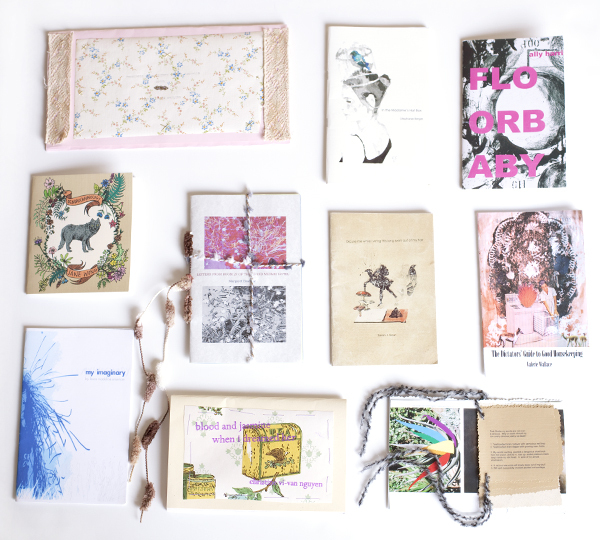 Lastly, I wrote about poetry chapbooks and three lovely presses for the ModCloth blog. You should check it out! pretty chapbooks from Dancing Girl, Blood Pudding, and Birds of Lace Press. Love your poem, and especially all the incredible images for your heart. Thanks for the shout out!